NEET Vital Pack. The smartest test pack for NEET PG. PrepLadder, the ultra competitive platform for Medical PG aspirants is proud to launch its smartest pack yet, The NEET Vital Pack. 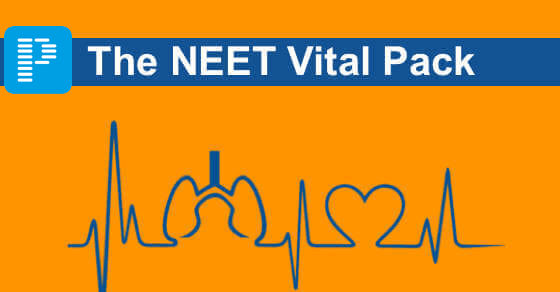 What is NEET Vital Pack? Due to the recent surge in image based questions in NEET PG, we have shortlisted 1,000 must know image based questions from all 19 subjects. These 1,000 images will cover most of the image based MCQs that can be asked in NEET PG. These are the questions that have high probability of appearing in NEET PG this year. These have been carefully selected to make sure you do not leave out the most important topics while preparing for NEET PG. 1,500 Recent Questions from previous NEET PG exams. Its common for NBE to repeat questions in its exams. We have shortlisted the questions that are most likely to be repeated from previous year’s NEET PG exam slots. So that you go prepared for these repeated questions. Latest updates that can appear in NEET PG this year. Latest updates are one of the favorite topics of examiners. We have collected updates from all 19 subjects at one place to make it easier for you to read and revise them. *Latest updates will not be in MCQ form. 1,500 Most common silly mistakes. Questions that most people answered wrong will be tagged as difficult questions by the Prometric software and these questions will have higher weightage. PrepLadder has collected user data from its thousands of test takers over 2 years to shortlist the most common silly mistakes made by test takers. So you can score much higher and can get a much better rank if you were clear about the concepts that other people make mistakes in. To see the complete test schedule, click here. Other features of NEET Vital pack? When can you join the NEET Vital Pack? Keep following PrepLadder for more updates, news and tips for NEET PG.